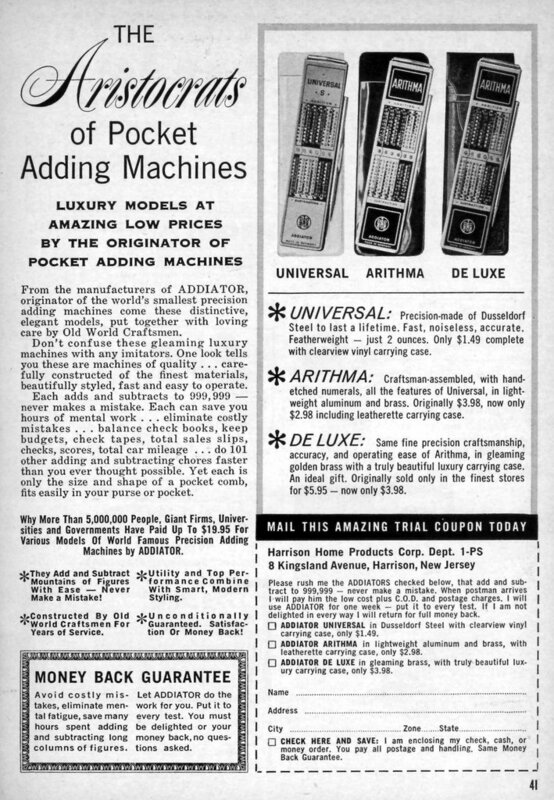 From the manufacturers of ADDIATOR, originator of the world’s smallest precision adding machines come these distinctive, elegant models, put together with loving care by Old World Craftsmen. Don’t confuse these gleaming luxury machines with any imitators. One look tells you these are machines of quality . . . carefully constructed of the finest materials, beautifully styled, fast and easy to operate. Each adds and subtracts to 999,999 — never makes a mistake. Each can save you hours of mental work . . . eliminate costly mistakes . . . balance check books, keep budgets, check tapes, total sales slips, checks, scores, total car mileage … do 101 other adding and subtracting chores faster than you ever thought possible. Yet each is only the size and shape of a pocket comb, fits easily in your purse or pocket. Why More Than 5,000,000 People, Giant Firms, Universities and Governments Have Paid Up To $19.95 For Various Models Of World Famous Precision Adding Machines by ADDIATOR. * They Add and Subtract Mountains of Figures With Ease — Never Make a Mistake! * Constructed By Old World Craftsmen For Years of Service. * Utility and Top Performance Combine With Smart, Modern Styling. * Unconditionally Guaranteed. Satisfaction Or Money Back! * UNIVERSAL: Precision-made of Dusseldorf Steel to last a lifetime. Fast, noiseless, accurate. Featherweight — just 2 ounces. Only $1.49 complete with clearview vinyl carrying case. * ARITHMA: Craftsman-assembled, with hand-etched numerals, all the features of Universal, in lightweight aluminum and brass. Originally $3.98, now only $2.98 including leatherette carrying case. * DELUXE: Same fine precision craftsmanship, accuracy, and operating ease of Arithma, in gleaming golden brass with a truly beautiful luxury carrying case. An ideal gift. Originally sold only in the finest stores for $5.95-now only $3.98. Please rush me the ADDIATORS checked below, that add and subtract to 999,999 — never make a mistake. When postman arrives I will pay him the low cost plus C.O.D. and postage charges. I will use ADDIATOR for one week – put it to every test. If I am not delighted in every way I will return for full money back. *	ADDIATOR UNIVERSAL in Dusseldorf Steel with clearview vinyl carrying case, only $1.49. *	ADDIATOR ARITHMA in lightweight aluminum and brass, with leatherette carrying case, only $2.98. *	ADDIATOR DE LUXE in gleaming brass, with truly beautiful luxury carrying case, only $3.98. Avoid costly mistakes, eliminate mental fatigue, save many hours spent adding and subtracting long columns of figures. Let ADDIATOR do the work for you. Put it to every test. You must be delighted or your money back, no questions asked. 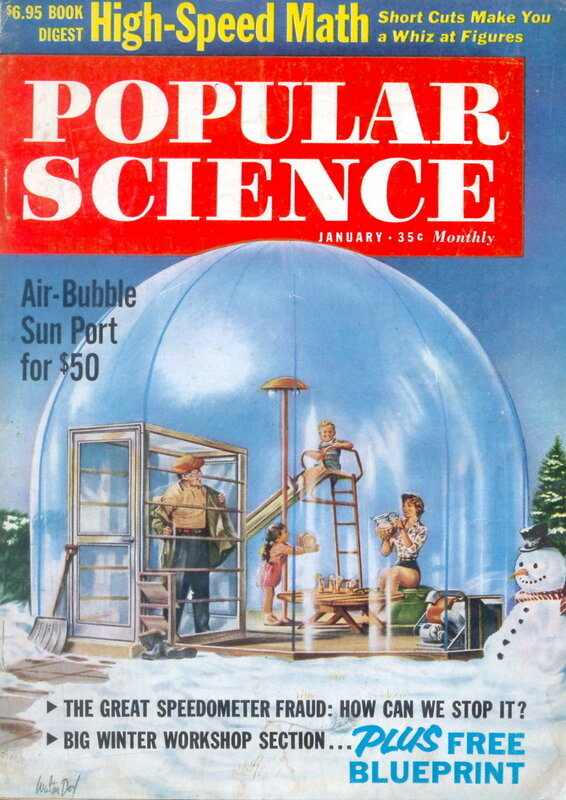 I still have a similar one from the 1950’s. It’s called ‘Wizard Calculating machine’ Add, Subtract, Multiply, Divide. divide by sequential subtraction. No batteries, ha! Goes well with a slide rule.